“Now,” writes John Waters in an essay published in The Dreaded Feast (an excellent anthology of holiday writing that’s currently on post-Kringle markdown at any number of fine retailers) “is the time for suicide if you are so inclined.” He is referring of course to the post-holiday malaise, when the party invitations have stopped flowing, you’re feeling five pounds heavier and you have already broken at least one-third of your New Year’s resolutions. Besides finding gems like The Dreaded Feast for half price at Copperfields, there are other things to get you the the mid-winter blues: primarily leftover holiday booze. Surely there is a magnum of Champagne that rolled under the couch, a bottle of mystery red wine from your boss or — what is this? 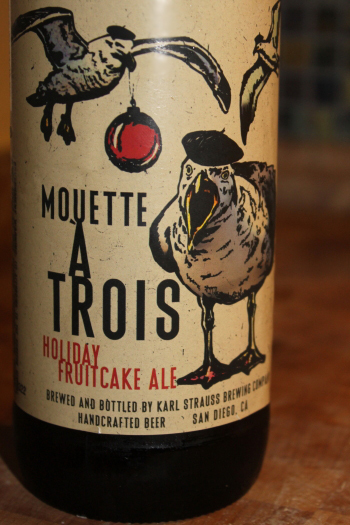 — Karl Strauss’s Mouette à Trois Holiday Fruitcake Ale in the corner of the fridge. 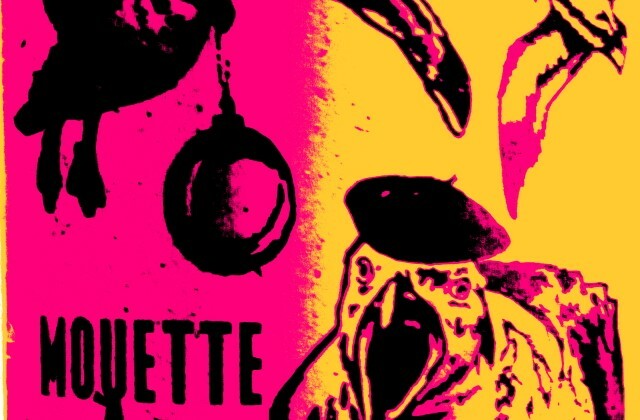 The rabid, homicidal-looking seagull in a beret on the label should have prepared me for the fact that this wasn’t going to be a sweet beer, or even an especially fruity beer. Sure, it smelled of stewed cherries, dried apricots (both of which were used in the brew) but there was also a distinct aroma of roasted meat (like the hunks of well-seasoned char you pick off the prime rib while your’e waiting for it to rest). On the palate the cherry flavors were delightfully sour and savory spices reminded me of Swedish Glog. The distinct vanilla on the finish hinted at the ales time spent in brandy-cured oak (which had previously manifested itself as charred meat). Sadly, we may never see this beer again, but next year be sure to look for four of something as Strauss continues its “Twelve Days of Christmas” offerings on an annual basis (Parrot in a Palm Tree, Two Tortugas and of course, this year, Three Seagulls). And may we recommend stashing at least one bottle in the produce drawer for a Tuesday night in January. It might just save your life.